The exhibit featuring the former carousel panel is on display at the Central Church of Christ on South Plymouth Avenue until mid-May. The panel depicts a caricature of an African-American child, with exaggerated features, being terrorized by a rooster — an example of pickaninny art. 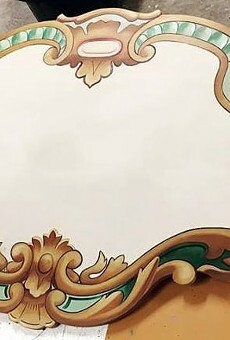 Many people found the panel offensive and it was removed from the carousel last year. A temporary panel is in place while community input is sought on what should permanently replace the pickaninny panel, RMSC President Kate Bennett says. The new exhibit is on display in Central Church of Christ, 101 South Plymouth Avenue, until mid-May. Its stops after that have yet to be determined, but eventually, the exhibit will be housed at RMSC on a semi-permanent basis. “It’s created as a travelling exhibit, so when the community asks for it, we will definitely make it possible with the city’s help to take it out into the community,” Bennett says. The Central Church of Christ will hold a community review and reception for the exhibit from 5:30 p.m. to 8:30 p.m. on Tuesday, February 28, at the church. It is free and open to the public. 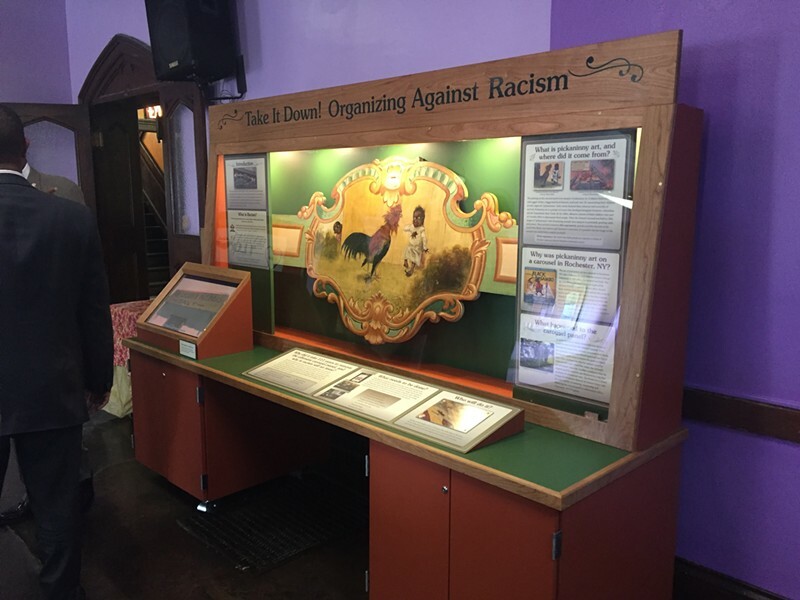 The exhibit is housed inside a wood cabinet with the panel, a monitor that shows video segments, and signs that talk about racism, history, and pickaninny art.